Eagles near The Golf Club property have likely laid eggs, according to Cape Coral officials. “That means they may have laid eggs there,” he said. The presence of the eagles could complicate efforts to build. If the eagles are proven to be nesting, developers would need to draft an Eagle Nest Management Plan for the 1,100-foot radius around the nest. Construction would be allowed only seasonally, built around eagle nesting season from October through May, and the area would have to be managed to provide optimum protection for the eagles. That protection zone encompasses a central chunk of the golf course property that includes where the clubhouse once stood. Officials cannot climb to the nest and check on eggs for fear of harassing the birds and disrupting a nest, he said. The posture of the birds is how biologists determine if the eagles have eggs. 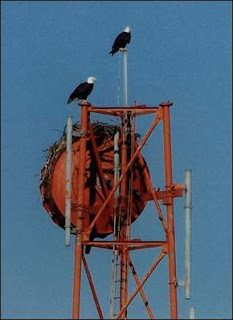 Community Development Director Hector Rivera wrote in a memo to a City Council member that a pair of bald eagles were first spotted on Nov. 8 on an unused Embarq telecommunications tower adjacent to the 177-acre property which once housed the Cape Coral Country Club. Florida Gulf Ventures, the current owners of the property, are trying to sell the 125-acre tract. The best appraisal for the land is about $28 million, according to planning consultant William Nolan. The property was first developed as a golf course by Gulf American Land Corp. during the initial development of Cape Coral. The property is surrounded by one of Cape Coral’s most-established neighborhoods and high-valued properties. Nolan said the property is not economically viable as a golf course, but said any plans for redevelopment of the site have not been finalized. “At this point, our plans are incomplete,” he said. But other property owners in the area are happy to see new neighbors soar in. “They look so wonderful sitting there,” said John K. Pierog, who has taken pictures of the eagles flying near the nest. Pierog said he doesn’t want anything besides a golf course on The Golf Club property and hopes the birds also help preserve his neighborhood. He bought a home near the golf course four years ago, and said he played at The Golf Club four or five times a month when it was open. Pierog lives in Cape Coral six months a year, and spends the rest of his time in Michigan. “They should have been making money,” Pierog said of The Golf Club management.